Although my focus is on players who starred in the 1990s, I occasionally find myself drawn to the legends of the game who starred in the previous four decades of the NBA. The 50 greatest players in NBA that were chosen in 1996 to mark the 50th anniversary of the league itself is a list that I regularly referring back to. Whilst I would like to add some vintages sets to my collection, I have enough chases going on to keep me busy for the moment. But every so often I do add do find myself drawn to a vintage card of an NBA legend. 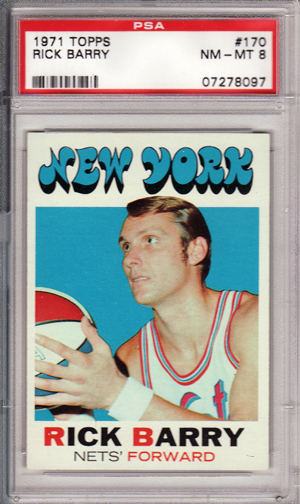 One such example is a 1971-72 Topps Rick Barry RC, that I picked up to recently. The thing that is unusual about this particular card from my perspective, is that it is graded. I am not usually one to buy graded cards, but this particular card was competitively priced, so I decided to make an exception. But now that I have it in my possession, I find myself wanting to remove the card from its 'slab'. I keep flipping it over in my hands, wondering if I should just go ahead and break it open. I like to (occasionally at least) hold the actual cards in my hands and it seems a little strange to think, that I will own a card never physically touch and remain encased permanently in plastic. It seems to detract from owning the card somewhat. Anyway, that is probably a decision for another day. I agree, there is something strange about the card being locked away for ever in a plastic case. I personally prefer to store my cards in Ultra Pro magnetic cases; they look amazing and at least it gives me the option of removing the card. Cards always feel better 'in hand' rather than in a case. Having said that, if it's a particularly rare vintage card then for the sake of its condition it might be wise to keep it encased. But in the case of this Rick Barry card, I'd probably bust it out of the case. I need to get with the program on magnetic cases. I am still very much a 'penny sleeve + top loader + team bag' person, but am not sure if this is the right answer for thicker cards.